The featured Ride of the Month is Ken Brown’s (FEP Username:85GT-79FJ40) 1984 Mercury Capri RS 5.0. Ken purchased his Capri RS in August of 2011. He had just sold his 1985 Mustang GT two weeks earlier, but knew he couldn’t live without another Fox for long. Ken decided he wanted to go a different direction with his next Fox and the number one requirement was it had to be cheap! Jeff (Capriman86) dangled a carrot in front of Ken in the form of a Craigslist ad for possible candidate just an hour from Ken’s home. The history of this Capri RS is interesting as Ken purchased it from the original owner with only 80,000 miles on the odometer. The Capri was the original owner’s baby for most of it’s life, but 4-5 years before Ken purchased it the brakes failed on the owner. So the owner parked it, bought the parts to make the needed repairs, but unfortunately decided to do the repairs the next Spring as winter approached in New Hampshire. The car was parked in the owner’s yard and he headed down to Florida for the winter. While in Florida the owner suffered a heart attack and unfortunately the repairs were never completed. So the Capri just sat for many years and began to sink into the yard. Finally the owner decided to part ways with the Capri. There were several potential buyers that wanted to buy it for scrap or parts not realizing how unique, rare, and special the Capri was and the original owner just couldn’t let that happen. Ken showed up to look at the Capri and informed the owner that he was interested in restoring the Capri. The owner accepted Ken’s first offer that night and Ken had a friend help him literally drag it from the resting spot in the original owner’s yard the very next day. Ken got the RS home and then the real work began. The Capri hadn’t seen much TLC over the years, but that was all about to change. The RS was mostly an original survivor, but needed a full restoration to meet Ken’s desires for it. So the disassembly began with a complete stripping of the uni-body down to the bare tub. Once the tear down was complete the restoration/rebuilding began in earnest. The RS had more rust and rot than initially thought, but otherwise Ken was fairly confident that he knew what he had gotten himself into. The beautiful red paint is not the original shade of red, instead Summit Racing’s Candy Apple red urethane was sprayed. Ken did retain the factory graphics and stripes to help keep the look of the RS true to it’s original theme. After the paint and graphics, Ken installed all new reproduction emblems, new weather stripping, and refurbished all the trim. In the engine bay, Ken was a bit more restrained with just some simple bolt ons to improve the power of the original 5.0. An Edelbrock Performer 289 intake as well as one of their Performer carburetors was installed to add some breathing to the 5.0. 1986 stock tubular headers, BBK off road X-pipe, 2 ¼” Thrush Turbo mufflers, and stock 1986 stainless steel tailpipes were installed to free up as many ponies as possible from under the hood and give that wonderful V8 rumble an enhanced tone. Ken installed a short shifter he purchased off Ebay as well as a Steeda clutch quadrant & firewall adjuster to improve the shifting action of the stock 5 speed transmission. To get that just right stance, Ken installed a pair of Ford Racing B springs in the rear and cut ½ of a coil off the stock front springs. The RS currently rides on a set of 87+ GT “Turbine” wheels with a new set of tires scheduled to be installed this spring for this year’s driving season. The interior remains essentially stock with Ken installing a Sony stereo to crank out the tunes when he isn’t listening to the tunes from under the hood. He also installed a Grant steering wheel to help with the steering and a set of 3 point seat belts from a later model Mustang in the back seat for added safety for the passengers. The awesome restoration of this Capri RS allowed Ken to win First place in the Non-Mustang category at the 2013 Ford Fest. The Capri also took second place at the Smoking Stangs in 2014. These awards as well as this month’s Ride of the Month win are even more impressive when you consider that Ken has done virtually all of the work (including the paint & body work) himself and in his own home shop. Although there are plenty of things Ken would still like to do to the Capri, he’s very happy that the car is once again road worthy and able for him to enjoy as often as possible. During Ken’s last drive the odometer rolled over a mere 85,000 miles which Ken plans on adding even more to as often as possible. In the near future the plans for the Capri are to continue to improve it with the addition of more power, better handling, a working A/C, and all kinds of other good stuff. Congrats Ken! The car is beautiful! Congrats, love seeing restorations like that! Thanks guys. It was quite a project and there's still plenty more to do when I can find the time and funds. But it's been saved and weather-permitting I can drive it whenever I want. Currently there's 3 feet of snow right outside the garage door where it's parked. I still haven't had the chance to meet up with the original owner but I hope that will happen next summer. Great looking car! Well done. Congrats Ken! Great to see the Capri saved. You did and outstanding job restoring it. It is beautiful. That is one beautiful ride!! Simply and AWSOME Capri!! GREAT work!! Wow!!! That's all I can say! 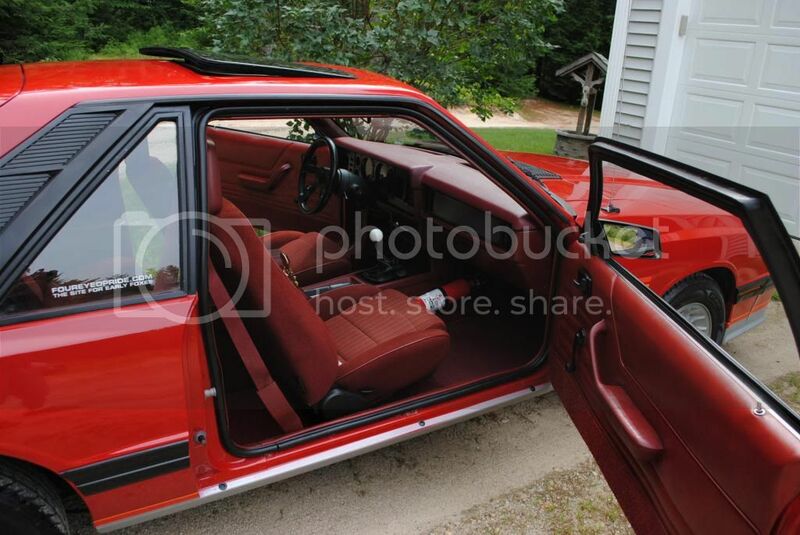 Man you just don't see beautiful red interiors like that on foxbodies. So much hard work went into this restoration. Excellent restoration job, Ken. The Capri looks stellar!! Congrats buddy! Can't wait for the first cruise. Hope you can make it. Great looking car. Love those Capris. Congrats. Looks wonderful! Congrats and thanks for the hard work!